Setting new trends in the area of fine compression stockings, the Juzo Attractive Class 1 Sugar Below Knee Compression Stockings with Open Toe can be distinguished from the standard fare by its especially fine knit. Offering a stylish transparency comparable to any fine stocking, there is as much fashion as function about Juzo's Attractive Range. 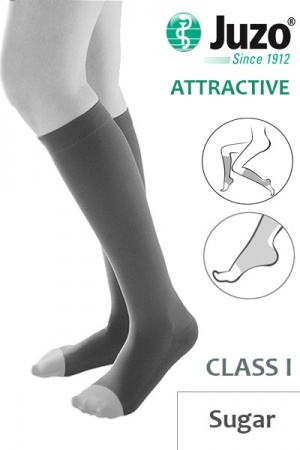 Juzo Attractive Class 1 Sugar Below Knee Compression Stockings with Open Toe are non-returnable and non-refundable on grounds of hygiene. 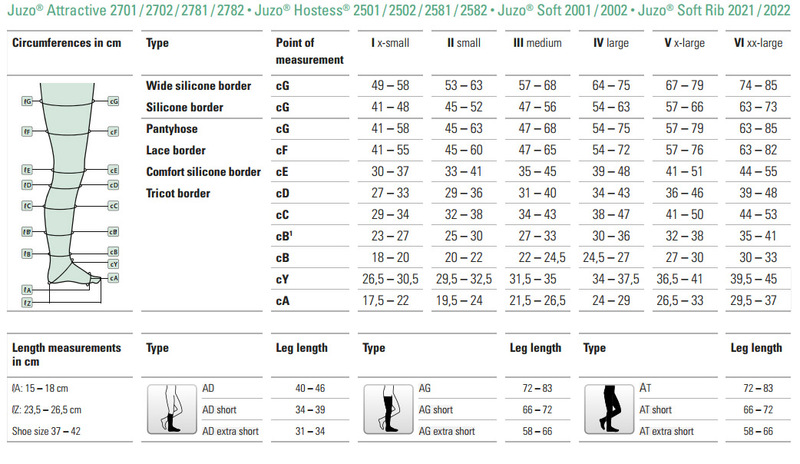 To find the necessary size of Juzo Below Knee Stockings, please refer to the chart below. Measure the circumference of your legs at the indicated points and find the size that is best suited for you. If your sizing is inconsistent with a single size, we would advise you to choose the largest size to ensure that your stockings are comfortable and have an appropriate size. Please be aware that Juzo Attractive Below Knee Stockings are available in two lengths: short and regular. To ascertain which size is best suited for your needs, measure your leg from the end of your toe to below your knee and refer to the information below.